Living in the Pacific Northwest, where water is plentiful both on the ground and in the air, it’s only logical that the Cold Outdoorsman’s first adventures involve kayaking. I’ve gone ocean kayaking in the warm climes of the Caribbean, but venturing into the colder waters of the Northwest has always seemed brash. Not any more. 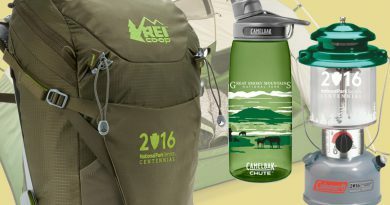 With tandem kayak in tow, my wife and I headed out for a three-hour trip each with a 220cm Carlisle Day Tripper kayak paddle in hand and a fun time on our mind. 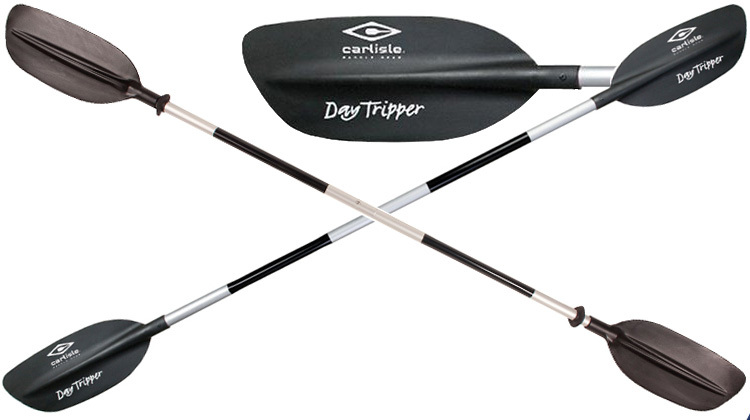 Like many kayak paddles for recreational boaters, the Carlisle Day Tripper kayak paddle comes in two pieces for easy transportation. The sides lock together using a push-button system that allows boaters to align the blades either inline or at a 60-degree angle for right- and left-handed control. The paddles’ 220cm length was also ideal for our needs, both because we’re 5′ 9″ and because the Wilderness Systems Pamlico 135 we used for this trip is 35″ (79cm) wide and required the extra reach of the 220cm shaft. 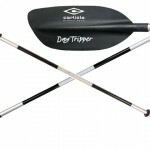 The Carlisle Day Tripper kayak paddle cut through the water with ease, and never did it seem too heavy. Its weight had been a concern at first, as carbon fiber paddles seem to be the “paddle of choice” for most experienced kayakers. I’ve previously boated with a $135 carbon fiber paddle, and it surely was nice. Yet after using the Carlisle Day Tripper kayak paddle for more than two hours, not once did I think it was any less precise or any heavier than a paddle that costs $85 more. More important to me, though, was how it felt from a temperature standpoint. With its anodized aluminum paddle shafts, the Carlisle Day Tripper is more sensitive to heat fluctuations and conductivity than its carbon fiber kin. That’s just how metal is. 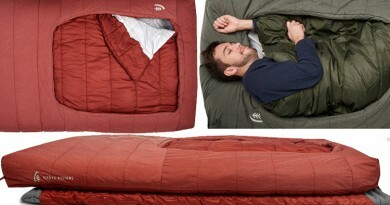 What drew me to these Carlisle paddles was their addition of a thin insulated area where you place your hands. In spite of its electrical-tape-thin appearance, this layer actually keeps the surface temperature notably higher than the uncovered parts of the shaft. For a guy who has Raynaud’s syndrome and the resulting cold hands, I found this to be an absolute must-have for kayaking. In addition to the thin insulation, the Carlisle Day Tripper kayak paddles also have drip guards where each asymmetric blade meets the shaft. Like the insulation, this seems like a small and innocent enough feature, but the water in the Northwest really is chilly, and anything that can keep it from contacting my cold-prone hands is a good thing. Between the $50 price of the Carlisle Day Tripper kayak paddle and several features that promote warmer hands, there’s a lot to like here if you’re just venturing into the world of kayaking. As time goes on and I test more paddles, it’s likely that I’ll find other strong contenders that can keep your hands warm while boating. But for now, Carlisle has my utmost thanks and respect for designing a kayak paddle that seems created specifically for people who hate cold hands.